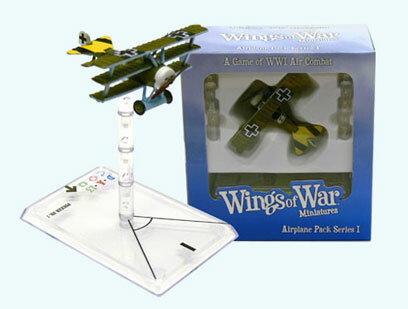 Take to the skies with Wings of War Miniatures! One pre-painted pewter-and-plastic model in 1/144 scale. Four clear plastic altitude pegs. One clear plastic gaming base, with stats, fire arc, and movement markers. One deck of maneuver cards, specific to the model of plane.